A thorough review of radon mitigation technology including active soil depressurization, ventilation approaches and guidance for those difficult to mitigate situations. Audio for convenient listening and online review questions and certificate generation. This version has a large question set and is approved for 24 credit hours and is great for mitigation contractors who also hold a measurement certification and need 24 credit hours for renewal of their NRPP certifications. Arnie said: It was excellent! Peter said: Very well put together. It's always good to acquire some additional knowledge. Tim said: Thanks for providing the course. Greg said: Very comprehensive study materials. Nice to have the audio option. Jay said: After being licensed for mitigation and measurements for over 10 years, this course has been the most relevant to real life mitigation and measurements. Carl said: Very Applicable Content! 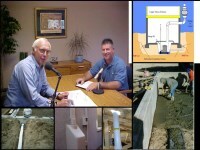 Heather said: Doug and his team have created an excellent source for Radon training. Steven said: Great job as always. Taylor said: I enjoyed the communicative presentation of the course, not just listing information but having a conversation. Bradley said: Good audio presentations for out-of-office listening. Good questions, with good feedback on correct answers to questions. Gregory said: Very informative course. Easy to follow. The program actually contained information that I had not seen before. Jim said: I have used CERTI for my initial education & continued education and am always satisfied! James said: very user friendly, I liked being able to down load and print the documentation. Aaron said: Great overall refresher of both basic and more complicated material. Scott said: Great course. Always stretches my brain! Kenton said: well done -- like the ease of use -- thanks! Robert said: I feel the quality is good and I learned a great deal. Todd said: Excellent on-line program. Great way to complete continuing education. Great content and very well put together. Carlos said: The course material is very informative and is presented in an easy to follow format. Jesse said: cost effective for a busy mitigator.